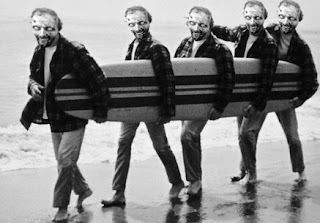 Dizgraceland: Night of the Living Beach Boys! 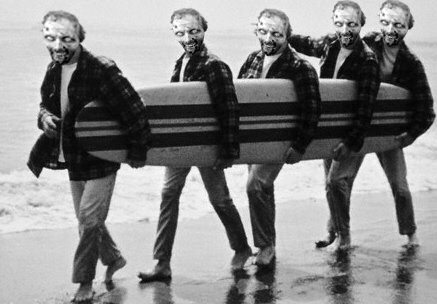 Night of the Living Beach Boys! I watched the Grammy Awards last night just to remind myself how old I am and out of morbid fascination to see what the Beach Boys looked like on their 50th anniversary. I'd seen Brian Wilson perform a few years back in what was billed as a Beach Boys concert. But he was the only Beach Boy there and he just kind of shuffled across the stage while much younger musicians covered the vocals, keyboards and guitar. At least there were four of them on stage at the Grammys. And although it wasn't overly embarrassing, it wasn't pretty. But as geriatric as the Beach Boys looked, at least I knew who they were. I can't say the same for 99 percent of the musicians performing, presenting or nominated. If they hadn't wheeled out oldies like the Beach Boys, Paul McCartney, Glen Campbell and Tony Bennett, I wouldn't have recognized many of the 20 somethings hip hopping across the stages. To his credit, Paul McCartney's voice still has it. I do miss the Beatles, though part of me is glad that John and George didn't survive to make a come back. I prefer to remember the Beatles the way they looked singing on top of their Apple Records studio for the album Let it Be. As for the rest of the token aged musicians, Glen Campbell seemed sober, so that was something. Tony Bennett didn't seem like he knew where he was, but he sounded okay. I am bummed that I miss Lady GaGa making her entrance on the Red Carpet being carried inside of what looked like an egg from the movie Alien. I did enjoy the blank look on her face when the camera zoomed in on her during the Beach Boys performance. I was pleased to see the Civil Wars perform a 10 second version of their song Barton Hollow as a opener to Taylor Swift's performance. Judging from the crowd's response, I was the only one who recognized them. So I am not totally out of it. I was pleased that 23-year old Adele walked away with six Grammys. Though until the Grammys, I had never heard of Adele. Great voice though. To make up for my woeful lack of knowledge of the current music scene, I am listening to the Grammy playlist on Spotify. By this time next year I should still be woefully lacking in my knowledge of the current music scene. But I am hoping Paul Revere and the Raiders will perform. I watched 20 minutes (it was on-line and midnight here) of the Red Carpet section where they took the photos in front of signs. Hardly recognised anyone - Cyndia Lauper was one. Adele? She almost passed me by until I saw a televised concert at Xmas. Ordered my first Adele CD yesterday. I might be behind the times, but I'm still chugging along. Am I the only one getting worried? Not to worry. I have just been out of town on business for a couple of weeks. But thanks for worrying!